Seeing the world being shaken to its foundations caused by the expansion of networks beyond conventional frameworks, and events such as conflicts, refugees and immigration crises, The U.K.ʼs withdrawal from the EU and the rise of populism, the 6th edition examined the state of the world through the themes of ʻisolationʼ and ʻconnectivityʼ. In order to elaborate on these themes from visual and discursive perspectives, the exhibition, consisting of loosely connected mini solo exhibitions like a constellation or an archipelago, was complemented by a series of cross-disciplinary public dialogs. 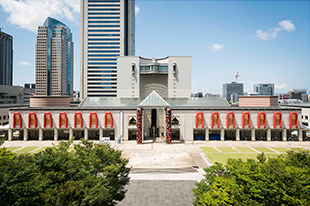 As 2017 marked the 150th anniversary of the return of power from the Shogunate to the Emperor, Yokohama Sites, which featured historical buildings and landmarks, that signify isolation and connectivity in Yokohamaʼs unique history. MEIKEN LAMWOOD CORPORATION, Mori Building Co., Ltd., The Bank of Yokohama, Ltd.